Looking for Independence Day ideas to include in your homeschool plans this summer? Whether you homeschool year round and need some detailed learning ideas or take a break in the summer and prefer something lighter, I’ve got you covered. Today I’m sharing ten ways to learn about America’s Independence Day and the background behind it. Celebrate Holidays in the USA: Independence Day is a downloadable PDF lesson intended for grades 2-6. Liberty: An American Revolution has a few different options that would work well with Independence Day lessons. Choose from an interactive game, analyzing newspaper headlines from the time period, and activities that view the revolution from different perspectives. Best for grades 6-12, We the People looks at the Constitution, compares original drafts of the Preamble with the final version, and evaluates the reasons for the changes. Techie Homeschool Mom’s 4th of July Online Unit Study is a good all-in-one option for learning about Independence Day with your kids. The study covers the Declaration of Independence in detail and includes some fun components about fireworks. 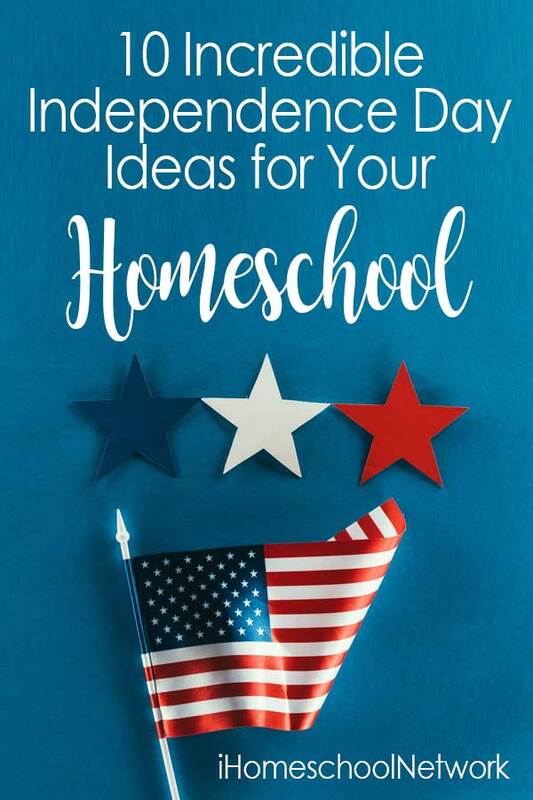 It’s a perfect choice for independent learning and for the homeschool parent who prefers an open-and-go Independence Day study. The Night Before the Fourth of July is a cute picture book to use for introducing young children to popular Independence Day traditions. America the Beautiful combines Wendell Minor’s beautiful illustrations with the poem by Katharine Lee Bates. Washington’s War from the Blast to the Past series is similar to the plot in Revolutionary War on Wednesday, but may be a better fit for older elementary students. Johnny Tremain is a good option for older elementary and middle school kids. This historical fiction classic follows the story of 14 year-old Johnny as he navigates the events of the American Revolution. The American Revolution for Kids is my favorite nonfiction option for exploring the path to America’s first days as an independent nation. It includes biographies, timelines, maps, and activities for hands-on learning. You can take your Independence Day learning on the road by visiting local historic sites, reenactment venues, or museums. Many of them have special events in the weeks leading up to July 4th. If you can’t manage a road trip, hop online and visit the White House through a virtual tour. You can also tour national parks and view museum exhibits through the National Park Service. A Red, White, and Blue Chemical Reactions activity is a fizzy and patriotic STEAM idea to add to your 4th of July lesson plans. This 4th of July Ice Melt Activity is a fun way to cool off from the summer heat while learning about solids and liquids. Add some building fun to your 4th of July learning with LEGO flag building and structure builds from Little Bins for Little Hands. An American History Chalk Pastel course is a fun and forgiving way to add creativity to your homeschool plans for Independence Day. Art for Kids Hub has some fun 4th of July-related drawing tutorials for the American Flag, Uncle Sam, and the Liberty Bell. My daughter loved making this watercolor resist Colonial flag. It had minimal steps involved, which makes it a nice choice for younger kids. The fidget spinner hype may be over, but you can still put them to use in your homeschool through Fidget Spinner Firework Art. Education.com has a variety of math worksheets and activities to go with your Independence Day learning. You can browse these search results to find the options that work best for your kids and then access them with the free basic account. You can find Fourth of July math sheets for addition, subtraction, estimation, and measurement at Royal Baloo. I’m all for learning through TV time, so naturally I’m excited to share these viewing options for Independence Day! The Liberty’s Kids cartoon series is one of my favorite ways to teach history through television. It begins with the Boston Tea Party and follows the events of the American Revolution. The Schoolhouse Rock America DVD isn’t exclusively related to Independence Day, but there are several videos here that would add some fun to your learning plans. Like the book by the same title, Disney’s Johnny Tremain experiences the American Revolution through the eyes of Johnny, a teenager who joins the Sons of Liberty. Looking for a few viewing suggestions that are less demanding on your time? Here are a couple of YouTube videos to help you learn: Independence Day and the American Flag and American Revolution in 9 Minutes. Lextin Eclectic’s Paper Lantern is an easy 4th of July idea for kids who like crafts, but my favorite thing about it is that no special supplies are needed. That’s a win-win! You’ll only need sticks, paint, and hot glue to create this Easy American Flag Craft. I love how this one looks and know my kiddos are going to love it too! This 4th of July suncatcher craft looks lovely and is a great way to use up all those broken crayons no one wants to use! This 4th of July Preschool Unit from A Teaching Mommy is a good option for little ones. Independence Day notebooking pages are great for all ages and can be used in lots of ways to document your 4th of July learning. Crayola.com has a Past and Present Flag coloring page available for free. Embark on the Journey has a 25-page 4th of July printable pack designed for preschoolers through second graders. You can find several Fourth of July printables for free over at Royal Baloo: Writing prompts, Silly Sentences, and Independence Day Tot Packs. What about you? Do you have homeschool suggestions for Independence Day? If so, share them with us in the comments so we can check into them. Emily Copeland is a Christ follower, church planter, and homeschool mom of two. 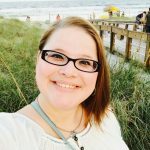 She blogs Table Life Blog where she shares practical ideas for homeschooling and encouragement for making the most of all the moments around the table.